East Coast Pools, Inc. specializes in commercial and residential pool resurfacing and pool renovation using Fibreliner™ vinyl ester resin. Fibreliner™ is specifically designed for swimming pools, waterslides, hot tubs and spas that must be resurfaced indoors or outdoors under various climates and conditions. EastCoast Pools, Inc. applies Fibreliner™ via our own proven six step Fibreliner™ process. As a top rated pool repair company we have over 23 years of experience in all types of pool repairs and spa repairs. We offer professional leak detection and pool leak repairs. Main drains, skimmers, pipes, pumps, filters, returns, heaters and control systems can be repaired, replaced or installed new. Underground water pressure caused this pool floor to fracture when the pool was being drained, EastCoast Pools Inc. made the repair with reinforced fiberglass matting to ensure this would never happen again. We also installed a missing hydrostatic relief valve which may have prevented this damage in the first place. 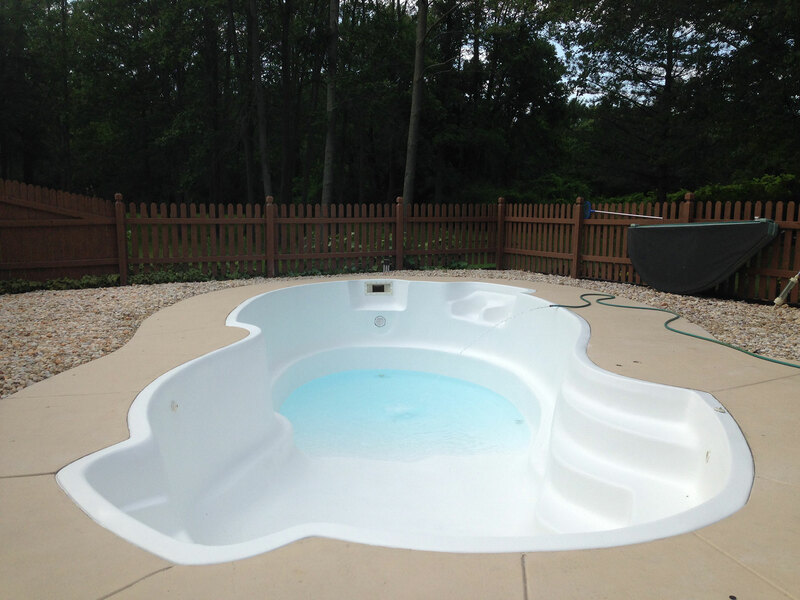 Wouldn't you rather be enjoying your newly remodeled or repaired low maintenance fiberglass swimming pool? Call East Coast Pools, Inc. today! East Coast Pools, Inc. proven 6 step swimming pool resurfacing process offers the strongest and longest lasting vinyl-ester resin surface in the swimming pool resurfacing / fiberglass swimming pool resurfacing industry today! Our professional installation process sandwiches the fiberglass mat between three layers of pure vinyl ester resin. There is no color pigment or fillers in this process and that is what makes Fibreliner™ far superior to any other fiberglass pool resurfacing system available today. Fibreliner™ can be applied to any structurally sound surface including fiberglass, concrete, concrete block, carbon, steel, marcite, wood and aluminum. The versatility of Fibreliner™ makes it ideal for indoor and outdoor pool resurfacing applications. Whether your swimming pool is exposed to the harshest winter conditions or sweltering summer conditions found further south along the East Coast ~ Fibreliner™ can withstand even the most extreme weather conditions. Step One: Fibreliner™ clear coat is applied to entire surface penetrating and sealing off tiny pores in the surface, this will ensure proper bonding of fiberglass. Step Two: we now apply Fibreliner™ pure vinyl ester resin (this coat contains no color pigment or fillers). Step Three: heavy fiberglass mat (1.5 oz.) is hand laid while the resin coat is still damp. Step Four: Fibreliner™ pure vinyl ester resin (this coat contains no color pigment or fillers) is applied over the top of fiberglass and air release rollers are used to contour and smooth the fiberglass. Step Five: the surface is hand sanded to remove any blemishes, all seal lines are installed and the first coat of gel coat (not colored polyester resin) is applied. Step Six: the final coat of gel coat is applied and now you have a true non-porous surface that will be a 100% water tight membrane for years to come. At this time swim lanes, wall targets, step highlight and custom logos will be applied. Fibreliner™ resurfaced pools installed by East Coast Pools, Inc.
BOTTOM LINE ~ Fibreliner™ and East Coast Pools, Inc.
What are you waiting for? You should be IN your pool, not working ON your pool. Call East Coast Pools, Inc. Today! Visit our project photos to view before and after photos from some of our pool resurfacing projects and see the Professional Pool Resurfacing Results for Yourself!